This workshop creates an AWS acccount and a Cloud9 environment. You will need the Participant Hash provided upon entry, and your email address to track your unique session. 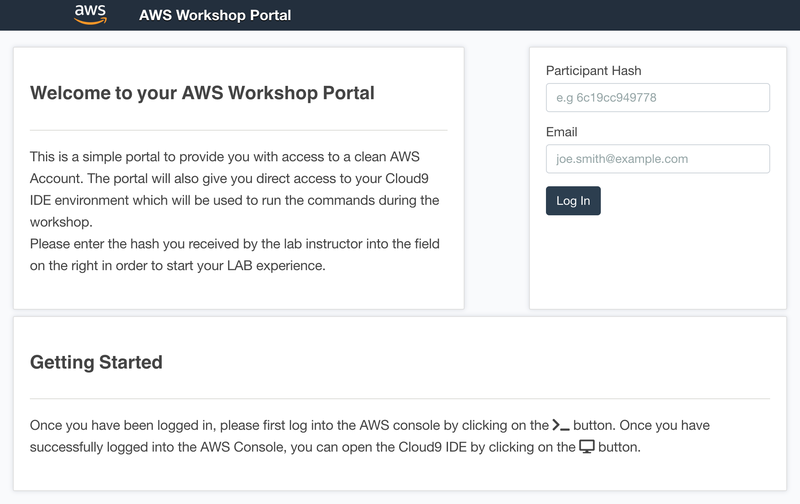 Connect to the portal by clicking the button or browsing to https://portal.awsworkshop.io/. Enter your Participant Hash and your email address, and click Log In. Once you have been logged in, please first log into the AWS console by clicking on the button. Once you have successfully logged into the AWS Console, you can open the Cloud9 IDE by clicking on the button. The workshop added an IAM role for performing all the steps of the workshop in the Cloud9 Environment. You do not need to add a role to the instance powering the Cloud9 Environment.